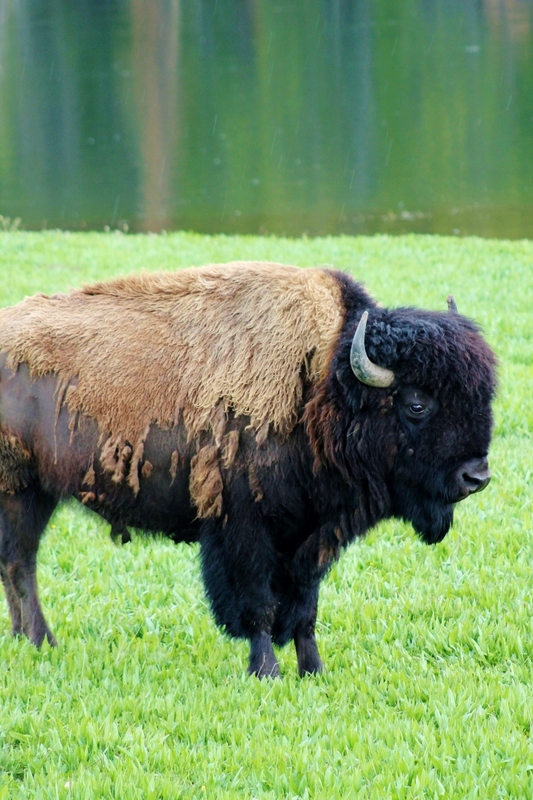 With an abundance of animals at every turn, it was almost like I was visiting a zoo. 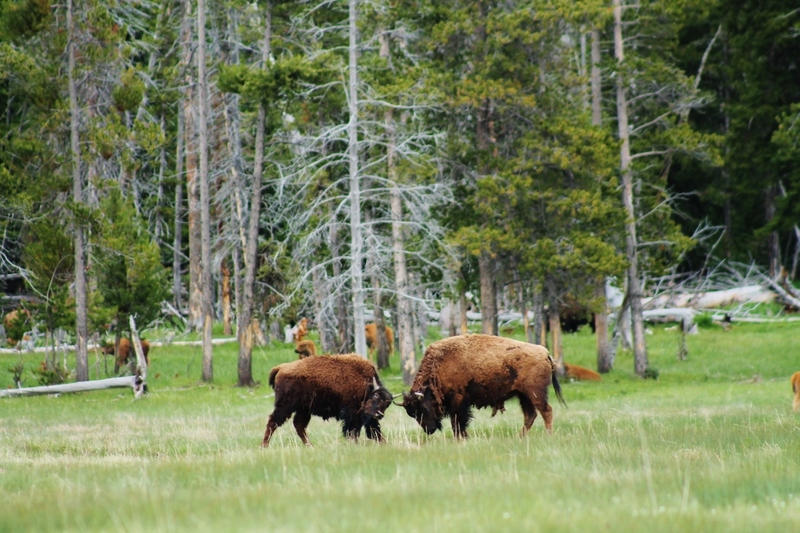 Yellowstone National Park is home to almost 70 different mammals, the largest concentration of mammals in the lower 48 states. 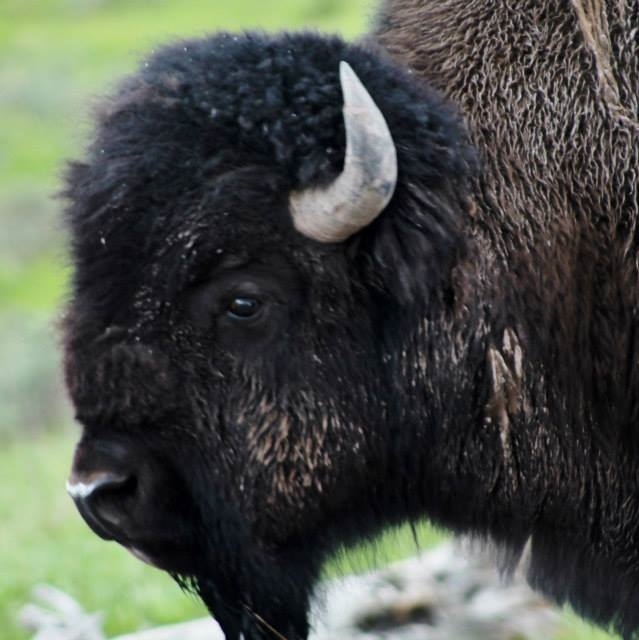 The park is most notable for its 8 herbivorous (bison, bighorn sheep, elk, moose, mule deer, white-tailed deer, mountain goats, and pronghorn) and 7 large predators (black bears, grizzly bears, lynx, coyotes, mountain lions, wolverines, and wolves). 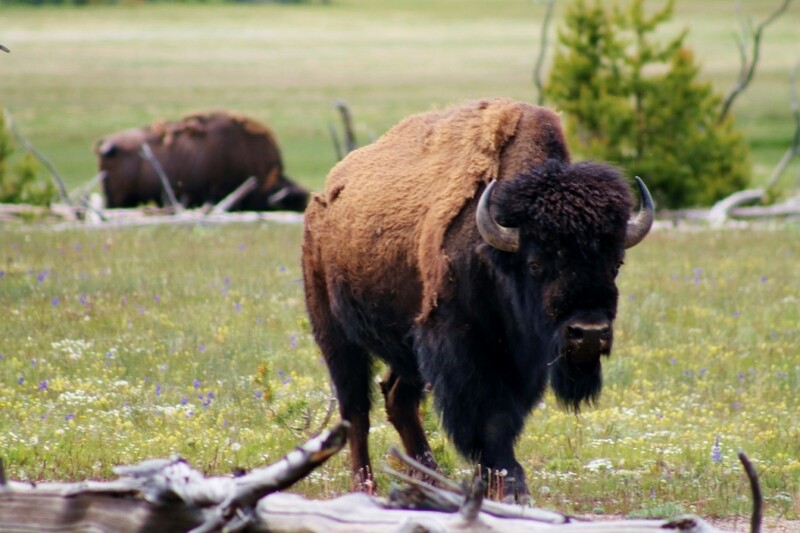 I was thrilled to see 9 of these notorious animals, and many others, during my one week trip to Yellowstone. I visited the park in early summer which is an exciting time of the year for wildlife viewing. 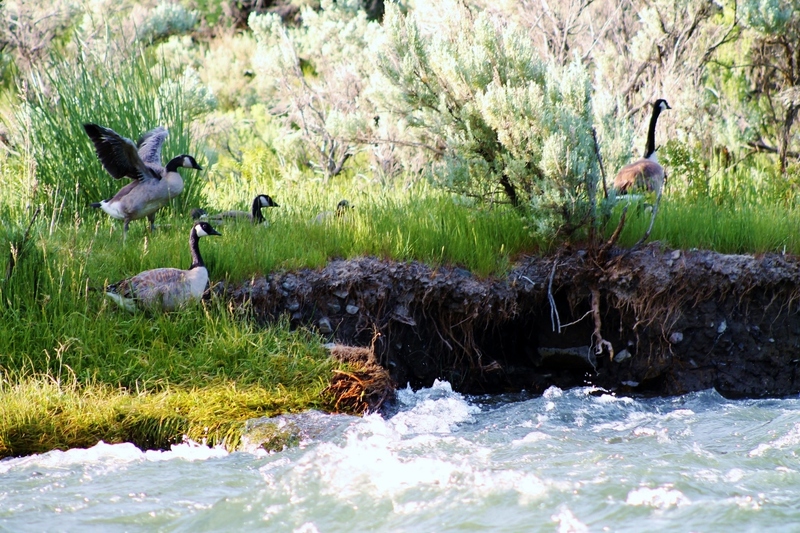 All of the babies that were born in the spring were out to play! 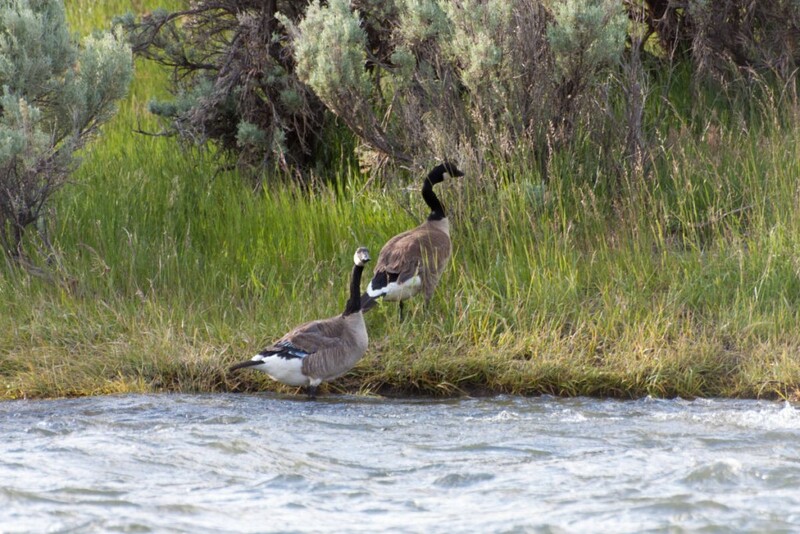 I was fortunate to have with me my brother, Kyle, and good friend, Ray, who were equipped with quality cameras that could capture wildlife from long distances. 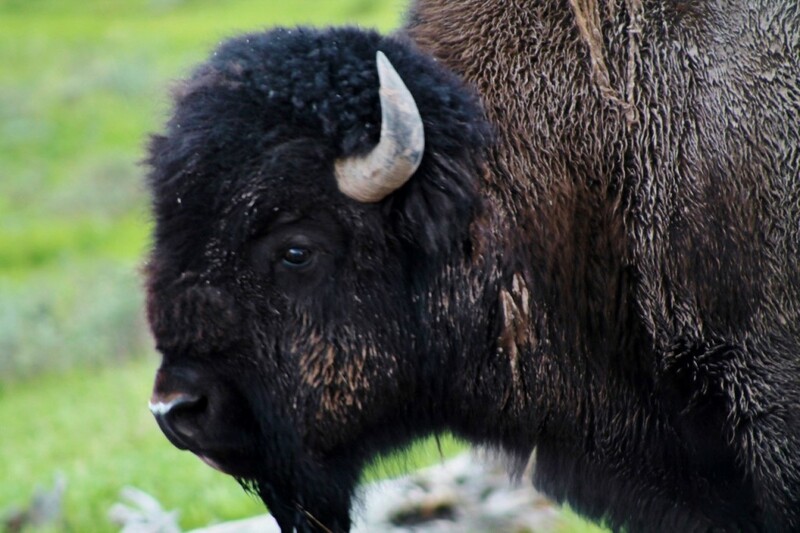 If there is one animal that you are sure to see when you visit Yellowstone it is the bison. 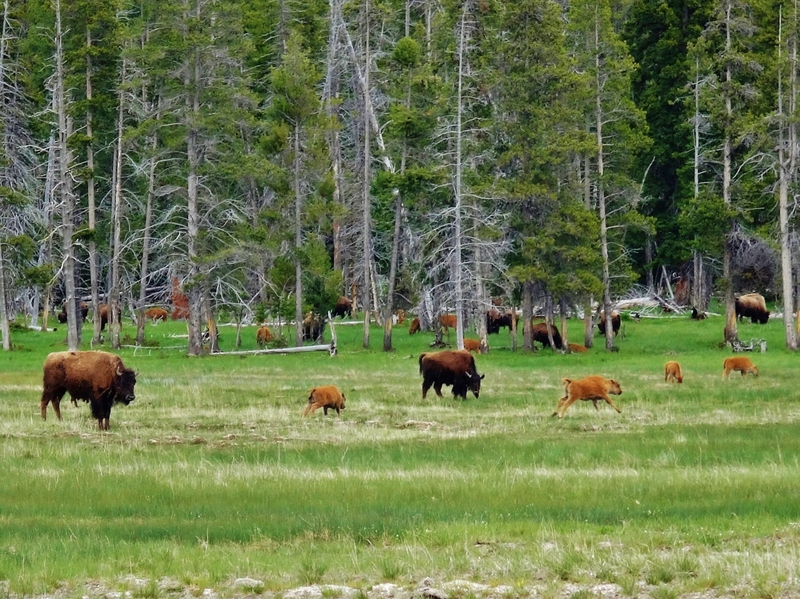 There are anywhere from 2,300 to 5,000 in the park at one time. 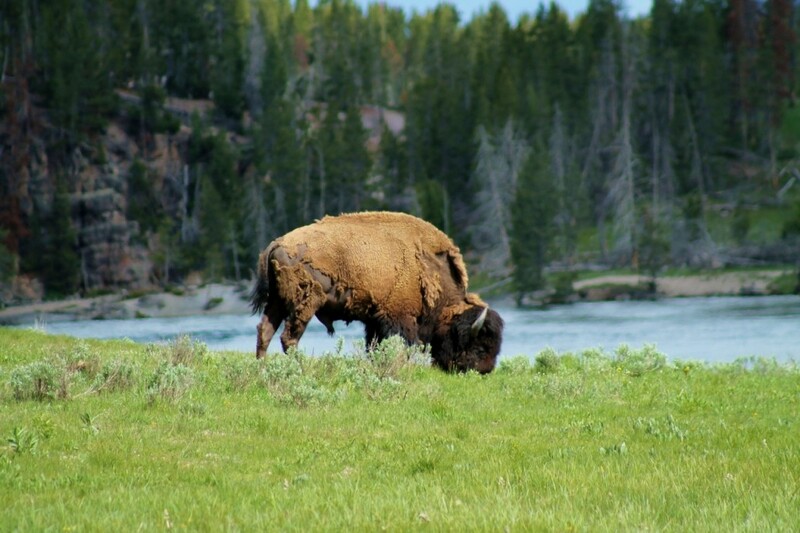 I remember seeing bison around every corner, sometimes in vast herds and other times as lone wanderers. 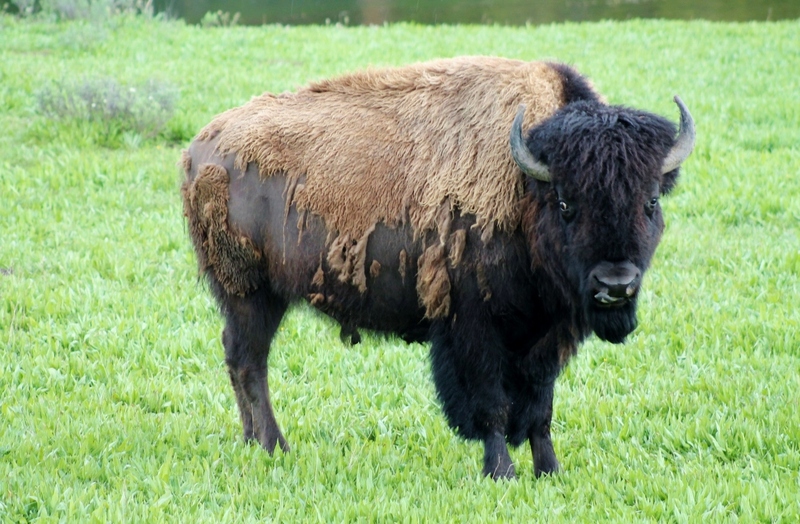 Mostly they would be peacefully grazing on grass along the road. However, there were instances when they got a bit aggressive with each other or at prodding tourists who got closer than they should have. 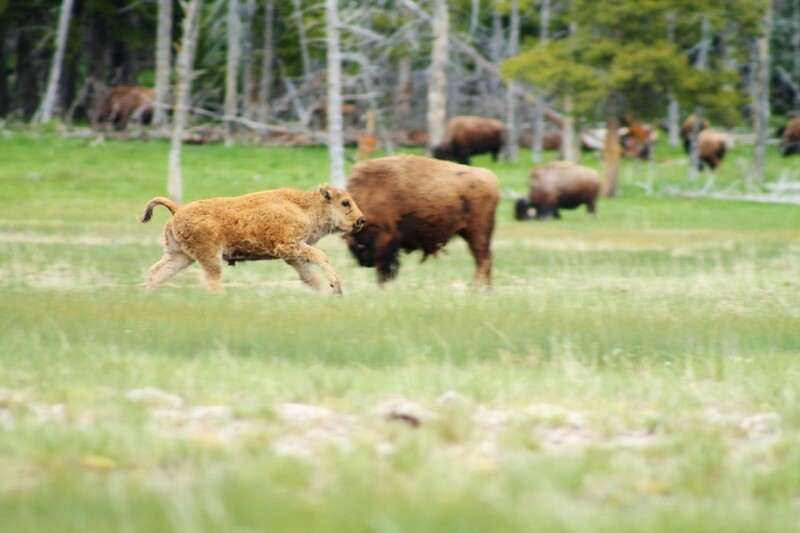 My favorite memory was watching the adorable bison calves happily playing and bouncing around Hayden Valley. 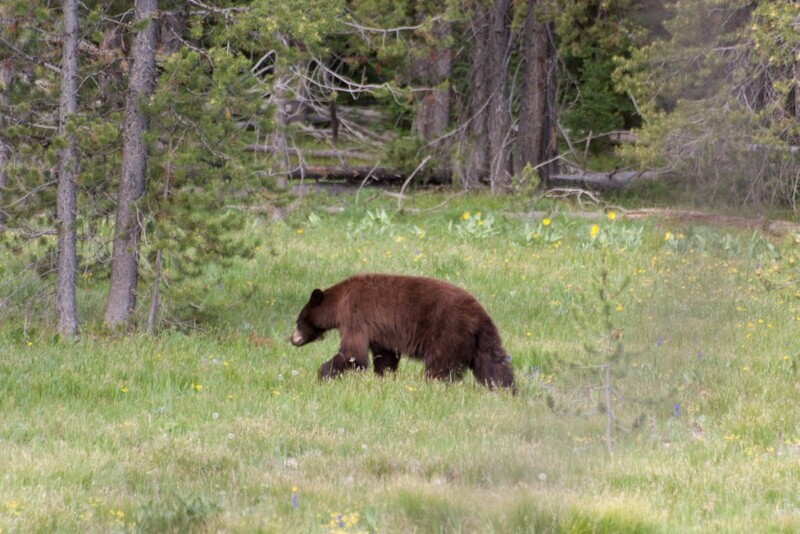 One of the most exciting (and scary) animals to see in Yellowstone are the bears. 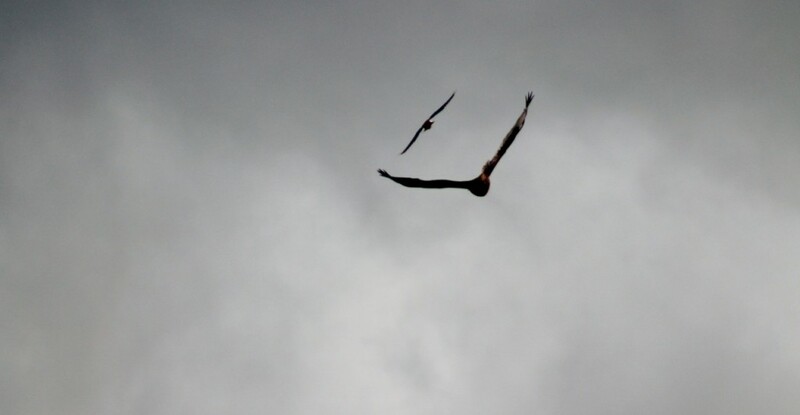 They aren’t easy to capture on camera because they are usually seen from a distance. 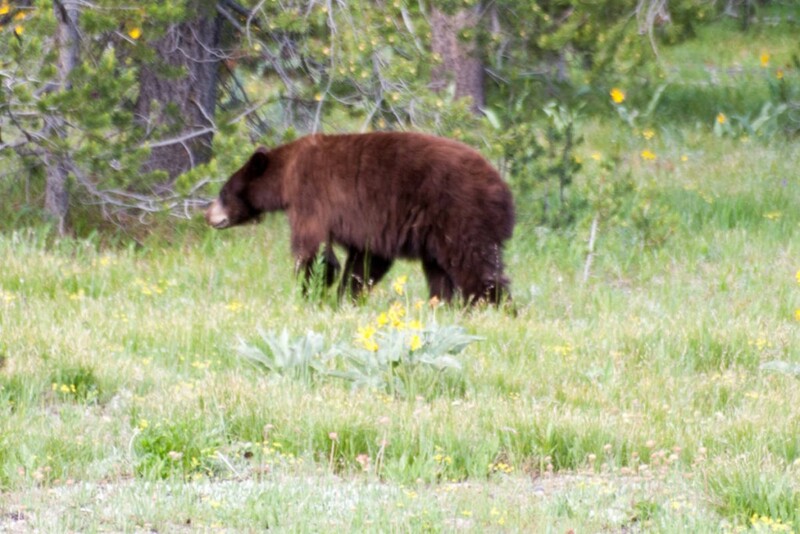 Fortunately, Ray was able to get photos of this one black bear, but we were lucky to see a handful of other black bears and even a grizzly bear with two cubs! After finishing a long hike on Mt. 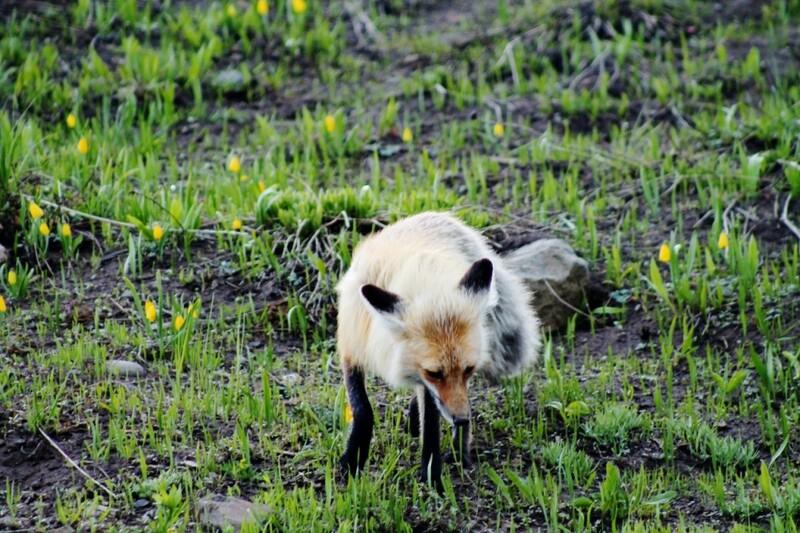 Washburn we saw this stunning red fox trotting gracefully along the side of the road. 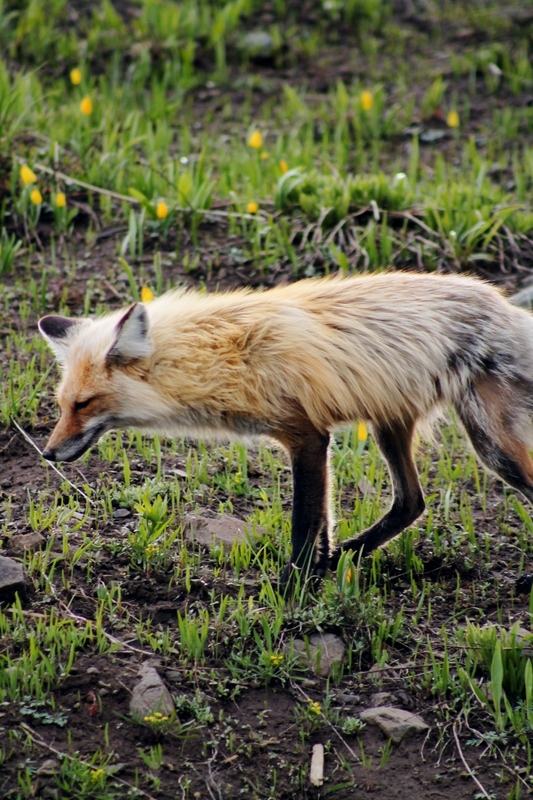 Red foxes are identified by their red fur with white-tipped bushy tail, dark legs, and long snout. 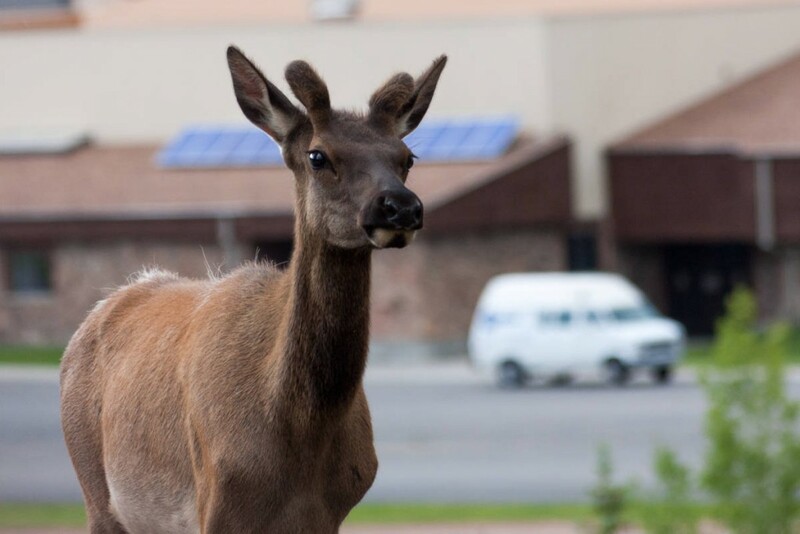 When in Yellowstone, don’t forget to look up! 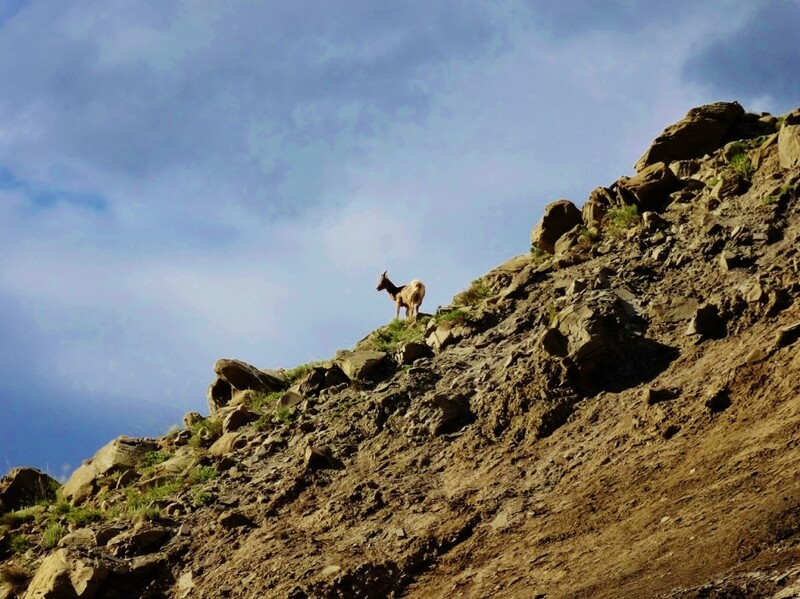 We saw a heard of bighorn sheep up in the rocky hills at the norther end of the park near the Wyoming/Montana border. 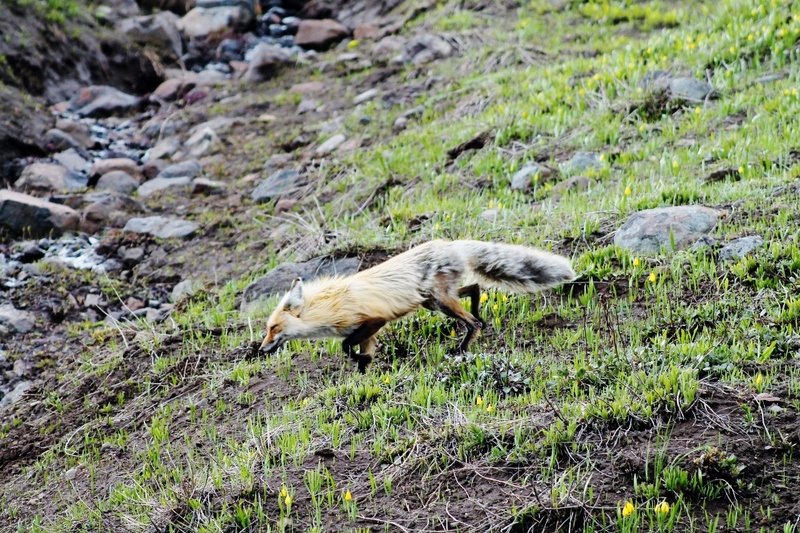 There were even some small kids stumbling up the mountain! 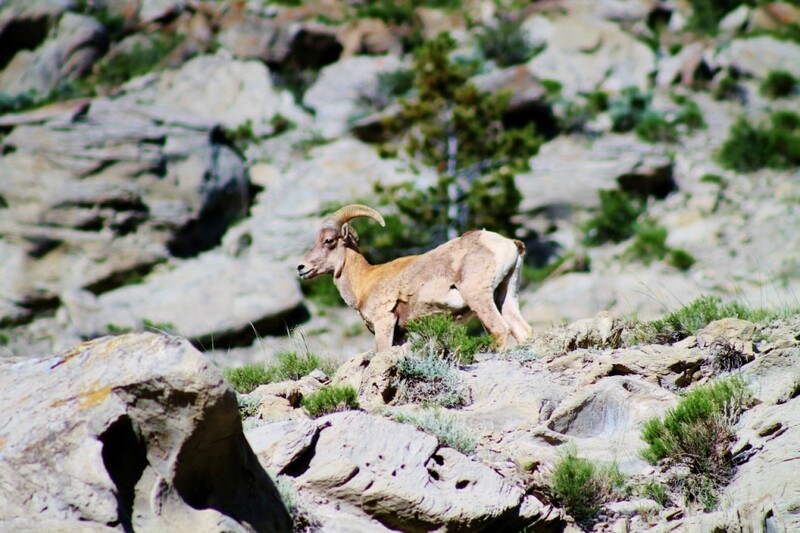 As of 2014 there were 421 bighorn sheep in the northern Yellowstone area. 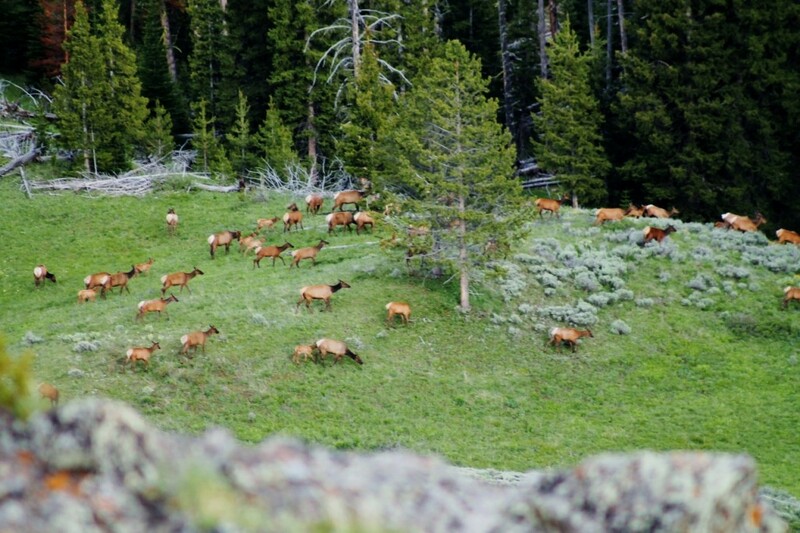 As Yellowstone’s most abundant herbivorous, elk are plentiful in the Yellowstone with up to 20,000 elk in the summer. 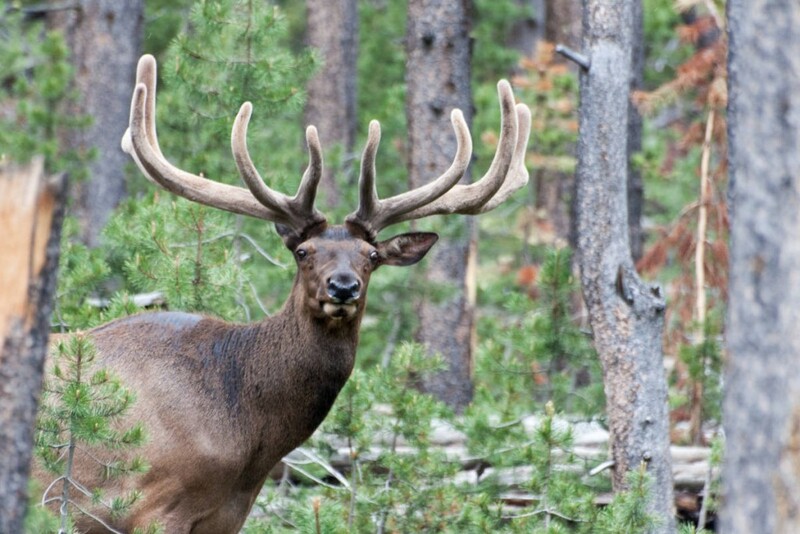 During the winter most of the elk population migrate out of the park and winter at lower elevations. 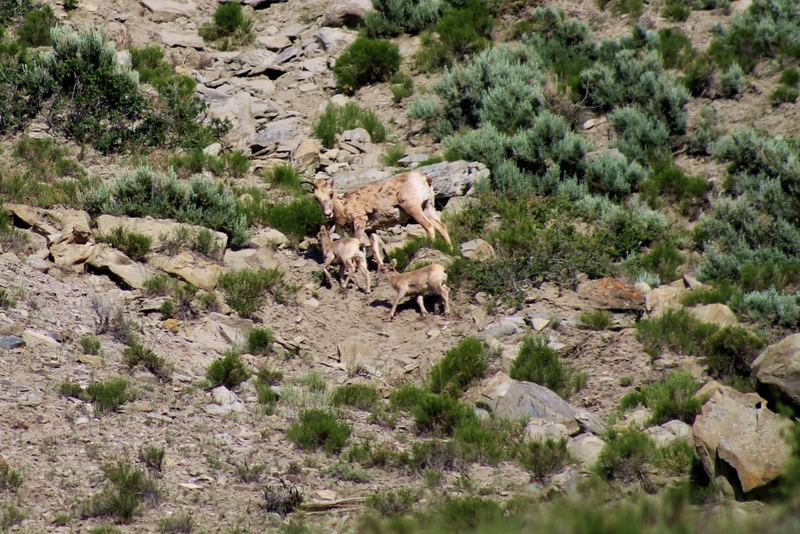 From a cliff ledge we watched a heard of over 50 elk cross through a valley below us. 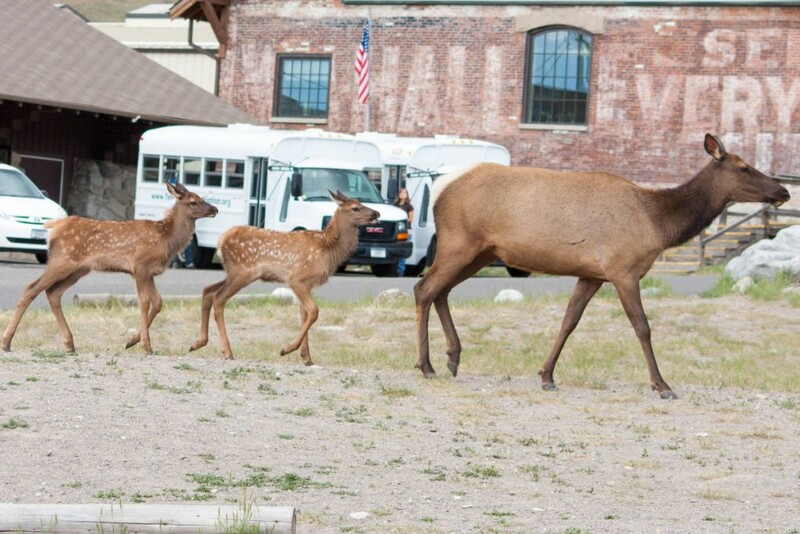 One of most favorite memories was when a mother elk lead her 2 calves safely across the street in front of our car. 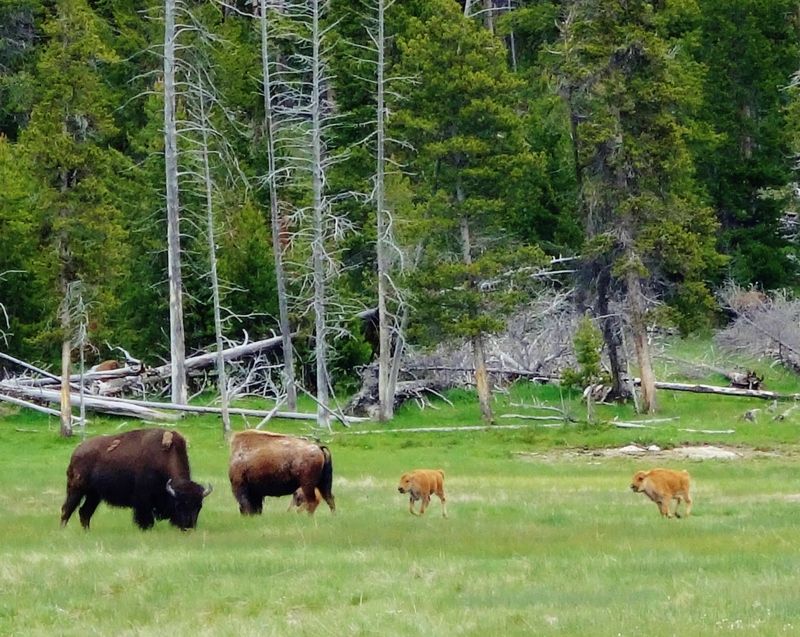 It was amazing to see these maternal instinct of these majestic animals right in front of us. 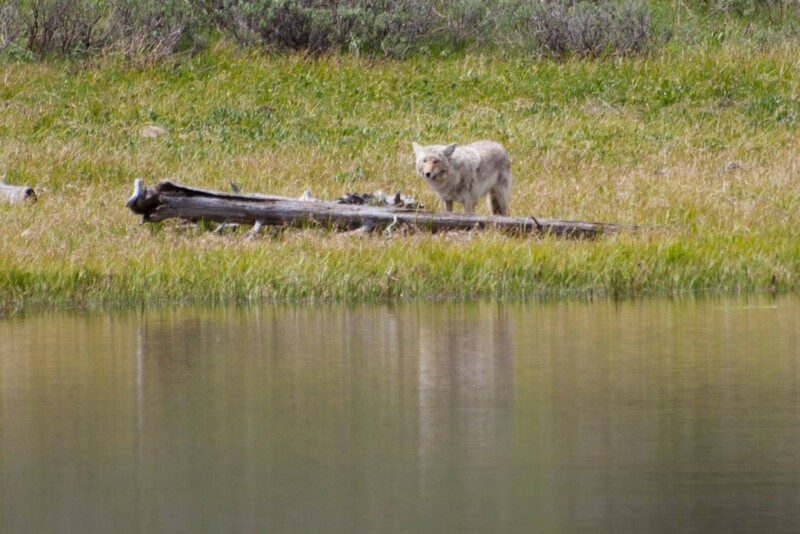 In 1973 US Game and Fish added the northern Rocky Mountain wolf to the endangered species list and designated the Greater Yellowstone area as one of three recovery zones. 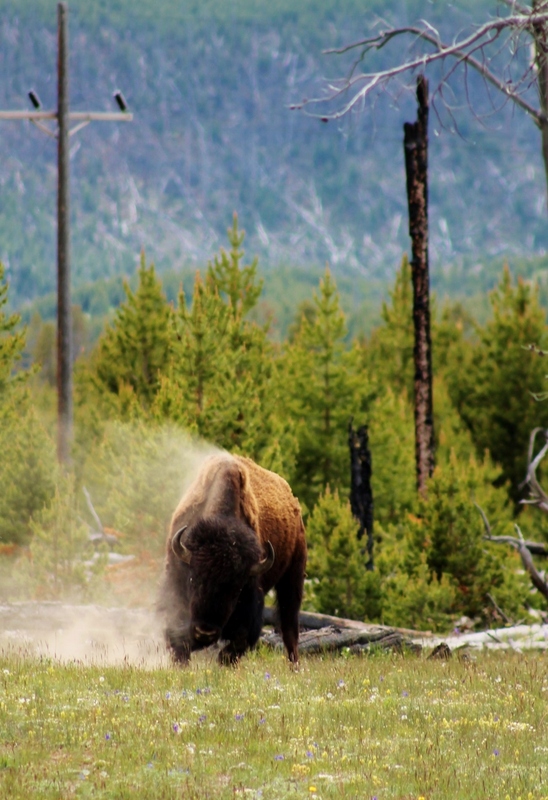 Starting in 1995, 41 wild wolves were released in Yellowstone National Park. 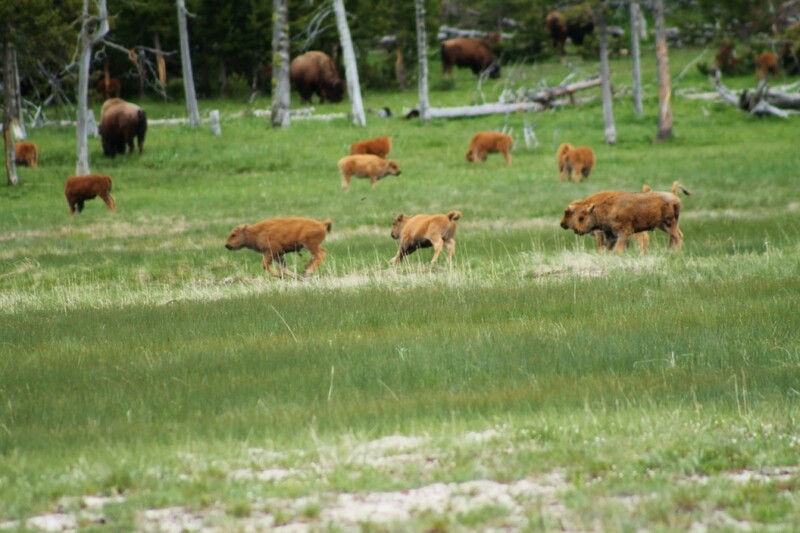 Today there are over 400 wolves in the Yellowstone Ecosystem, almost 100 of which were counted inside the park. 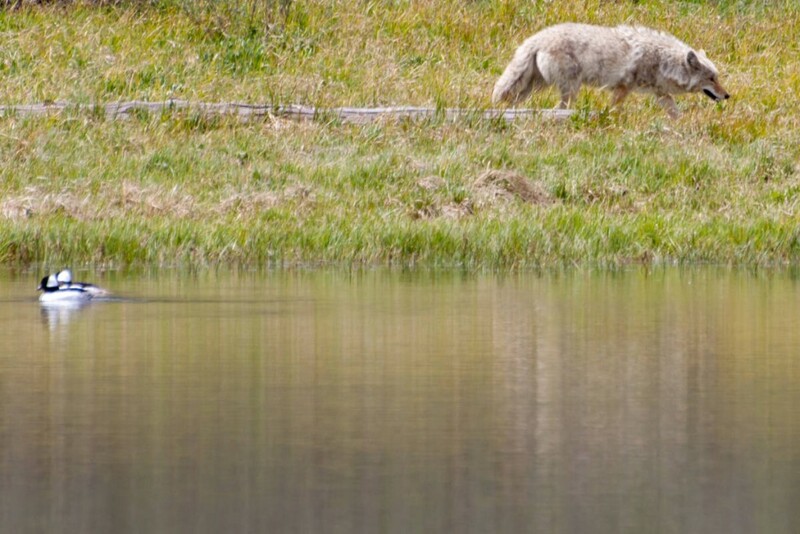 These wolves have three color phases with grey being the most common in Yellowstone, black is common in the Rocky Mountains, white is rare and usually seen in the high Arctic. 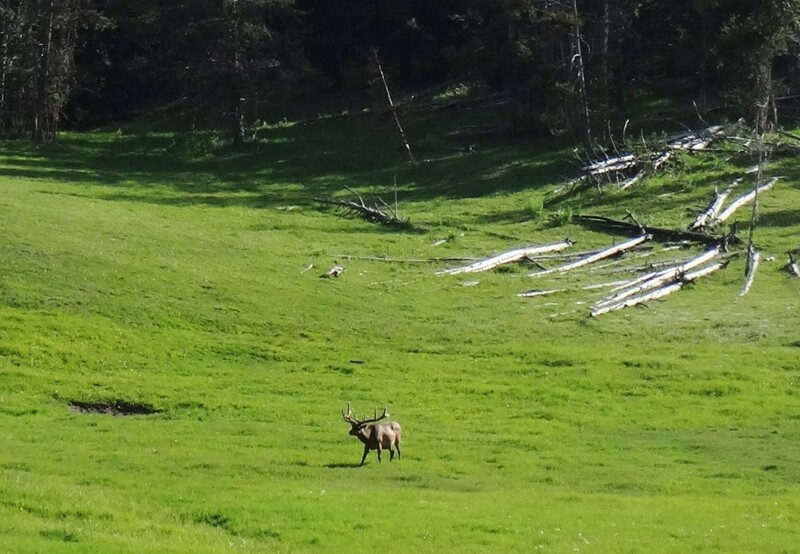 I was so thrilled to see this lone wolf on our very last day of our trip. 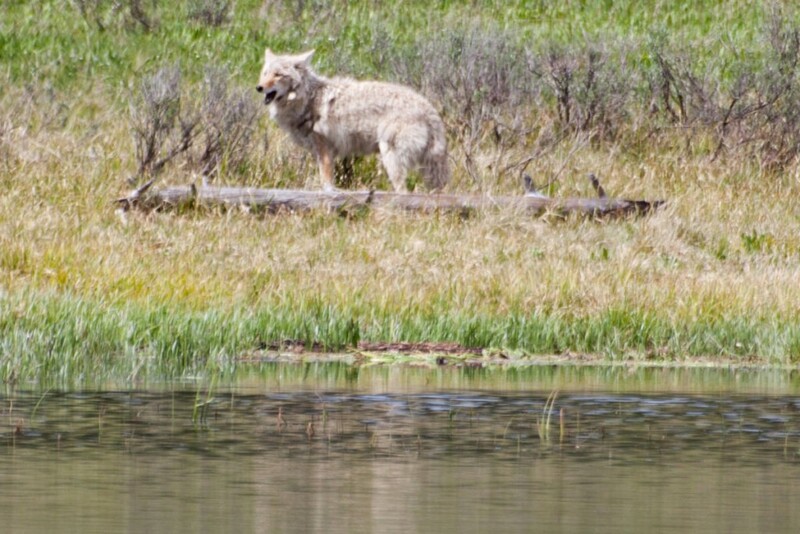 We were settled down for a picnic lunch near the shores of Yellowstone Lake when this graceful wolf stalked the edges of the water a few hundred feet from us. 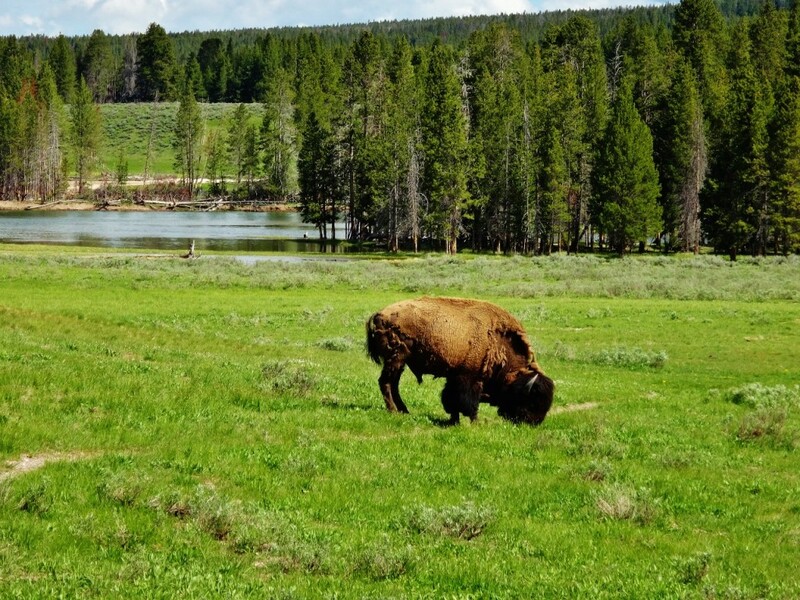 There are six species of reptiles in Yellowstone National Park, with the most common being the wandering garter snake. 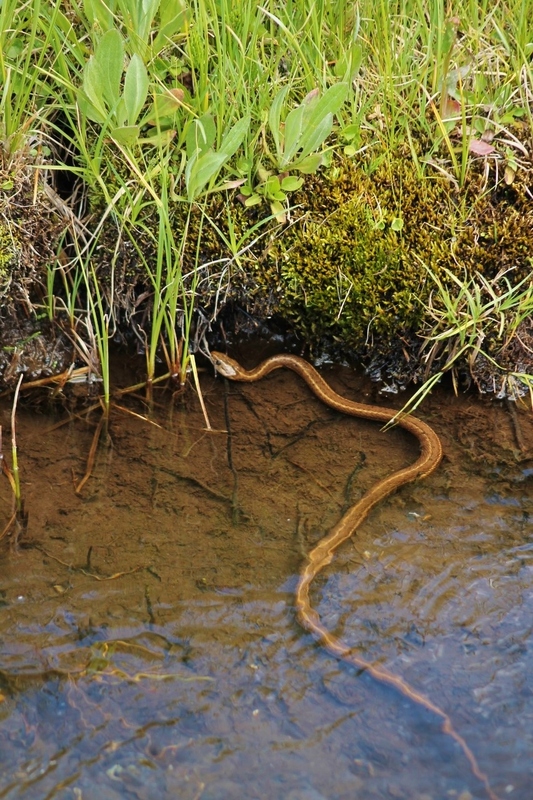 These snakes can grow up to 30 inches long, are brown with light stripes, and commonly found near water. 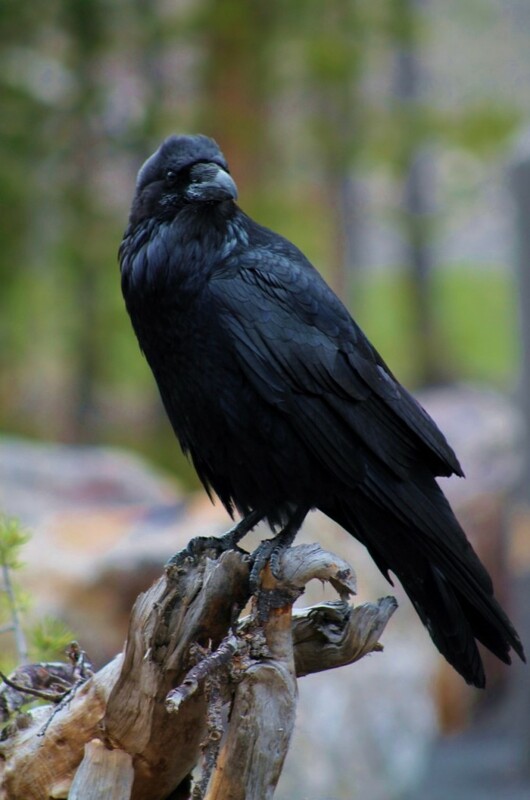 There have been over 300 species of birds documented in Yellowstone. 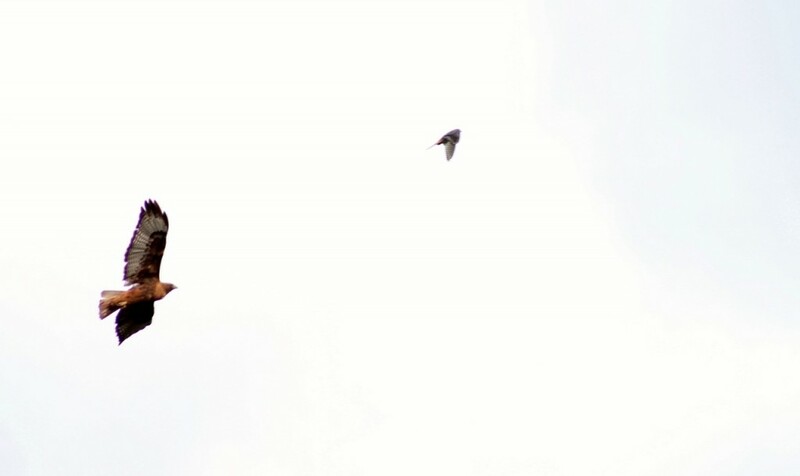 These photos depict just a few of the birds that we saw during our week stay in the park.